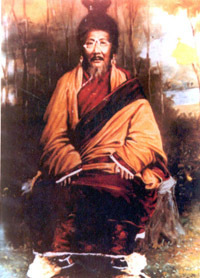 Drubwang Shakya Shri (1853-1919) is a widely celebrated spiritual luminary who exemplified both the Drukpa Kagyu and Nyingma traditions. He is regarded as a Tibetan Yogi Saint and a great Mahamudra and Dzogchen master. He also was responsible for commissioning the reconstruction of the Boudhanath Stupa in Kathmandu, Nepal. 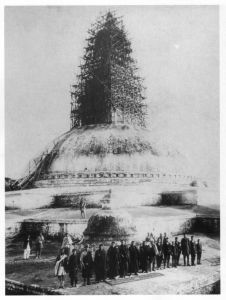 In the Early part of the 20th century the great siddha Shakya Shri sent his sons to restore the great stupa of Boudhanath. While Drubwang Shakya Shri is technically not in the eldest son birth lineage of the Ripa family, he was the great grand father of H. E. Namkha Drimed Rinpoche and subsequently the great great grand father to Gyetrul Jigme Rinpoche. Shakya Shri is deeply revered and respected by the Ripa family as a great teacher of both Mahamudra and Dzogpachenpo and is considered to be one of the root teachers of the Ripa Lineage.